The homeowner, looking for do-it-yourself solution for the paint job; Graco Paint Sprayer is the most reliable, long-lasting, meticulous and time saving Paint Sprayer in the market. 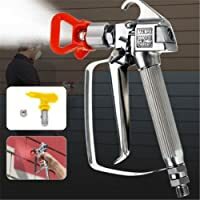 This Paint Sprayer is the top quality product that features even coats on indoor and outdoor projects thus giving full coverage with the silky smooth finish. Graco Airless Paint Sprayer is designed and manufactured using latest innovation. In conclusion, this brand believes in providing best quality products and services to its valued customers. That is why Graco Paint Sprayer Accessories are made available by the company itself to avoid any compatibility issues. 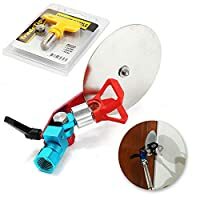 In case, you face any trouble with any component of the Graco Paint Sprayer or want to replace any damaged part, Graco Airless Paint Sprayer Parts are available in all major online shopping portals. Finally, you can get them right away at competitive prices and premium quality. Graco 24E375 TrueCoat Paint Sprayer Cup, 48 oz. 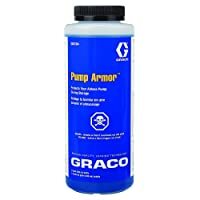 Graco 243104 Pump Armor, 1-Quart is the best protection for your Sprayer’s pump for storage and is freeze proof to -30° F. Its method of use is very easy and simple. After finishing paint job and cleaning up the sprayer, remember to fill the pump with Pump Armor fluid and leave it in until its next use. It keeps Graco Airless Paint Sprayer in operational condition when you want to use it again. It is compatible with all Graco Airless Paint Sprayers. Each bottle contains 1 quart liquid that is available at all major online stores in reasonable rates. Graco Tip Extension with an extending tip is available with Graco Airless Paint Sprayer and so it can facilitate the paint spraying on high, low or recessed areas like ceilings, stairways, soffits, high walls, overhangs or decks. Simultaneously, this eliminates the need for ladder or stepping stools and one can easily reach these tricky places with ease. These tips are designed to be attached with the Graco Paint Sprayers without any assistance of tools so their mounting process is quite simple and easy. The Tip Extension is 30 inches long. People use Aluminium thus make it light weight by durable. It includes 7/8 in thread. 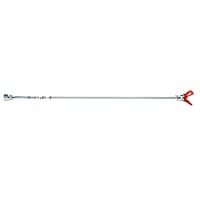 Furthermore, its also provide RAC IV Guard and Single Seal with the Graco Tip Extension. Additional hose can assist you in reaching far off areas where otherwise, it becomes impossible to reach. Graco is providing extra hose which is made available in the market in individual capacity that is purchasing as and when the need arise. It provides extra length to reach second stories all the while maintaining its performance quality. Length of the hose being provided is 50 ft. by ¼ in. Besides, it can endure maximum working pressure of 3000 psi. The spring guards that come with the hose are Zinc-plated, making them corrosion resistant and durable. 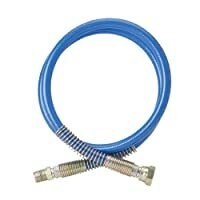 This hose can use with Magnum or Graco Airless Paint Sprayers. It comes with ¼ in. x ¼ in. connector as well. In short, remember that the maximum hose length that a sprayer can support is providing in the manual of the sprayer, which can pay a duly consultant. 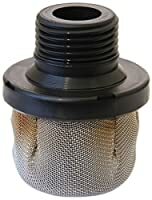 Inlet Strainer, as the name suggests, removes any debris or loose particles that may enter Graco Airless Paint Sprayer and might hinder the spraying process. In other words, this act protects the pump, minimizes tip clogging and gives you a quality finish. 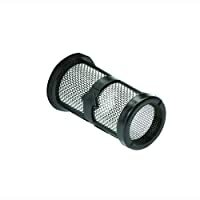 Replacing the Inlet Strainer regularly increases the life of the pump and reduces the clogging of the tip. People can also clean it on the regular basis, especially before using the paint sprayer. 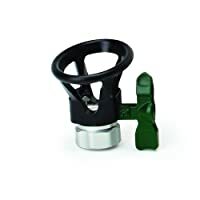 If the Inlet Strainer is damaged and has holes, it can let debris enter the Paint sprayer and damage the pump or affect the quality of the finish. It is designed to be compatible with Magnum models Project Painter Plus, X5/LTS15, X7/LTS17, ProX9/ProX19, ProX17/ProLTS170 AND ProX19/ProLTS190 Airless Paint Sprayers. Graco Pressure Roller Cover is an innovative addition to the Graco Airless Paint Sprayer Accessories. This Roller Kit is attachable to the spray gun without any help of the tools. It is impressively capable of an even flow of paint without any fuss of dripping or paint build-up during the paint job. With light-weight design, users can easy to operate without burdening too much. The pressure required for doing the paint job using Graco Pressure Roller Cover is also reduced and needs only 300 psi. They design it to use with Airless Paint Spray Guns with 7/8” thread. Graco Head Spray Nozzle has the ability to spray at variety of angles, giving you flexibility and agility to Spray at difficult angles as well. On the other hand, its 180 Degree Swivel attaches to the tip extensions and heavy-duty extensions as well. Its 3600 PSI provides maximum working pressure making the paint job hassle-free and high quality. It is provided along with 7/8-inch thread. 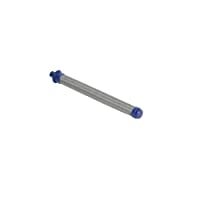 It is especially designed to be attached to tip extensions and heavy duty extensions. Graco TrueCoat Material Cup Liners are official Graco product. It can for lining the Paint Sprayer cup which makes the clean-up process easy and fast. Each package comes with 10 liners. 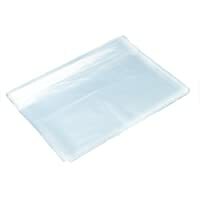 Besides, the material of these liners is plastic and these disposable liners fit either 32-ounce or 48-ounce cups. These liners are TrueTone paint sprayer compatible as well. By the same token, they are available at major online shops at competitive rates. Graco Reversible Airless Spray Tip is 4-6 inch spray pattern tip which is ideal for narrow surfaces such as deck railings, interior trim and outdoor furniture. The tip size is .011 inch (orifice) which is perfect for spraying thinner materials like semi-transparent stains, water sealers, stains or polyurethanes. In the same way, its reverse-A-Clean feature quickly clears the tip clogs by twisting the tip and spraying in the reverse position. Therefore, Users can easily install without any help of tools making the process hassle free. It is used with RAC IV Tip guard. The package includes tip and tip seal. Before using it though, do consult the manual to confirm the maximum size of tips your sprayer supports. Graco Straight Hose Swivel and the gun attaches between the airless spray hose and the paint sprayer gun. It relieves pain and strain in the wrist while spraying for a longer periods of time. They design with the pressure of 3000 PSI and more commonly bought with SG1 and SG2 sprayer guns. It is genuine Graco part manufactured especially for Graco Airless Paint Sprayers. 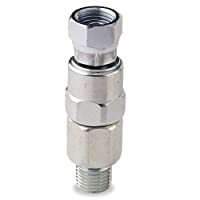 This Straight Hose Swivel connector can also use when pressure rolling to avoid any damage due to hose twisting. It fits spray guns and airless paint hose with ¼ in. thread. It is directly installed to spray gun. 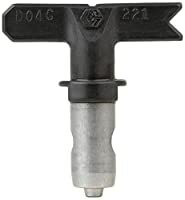 Universal Spray Guide Accessory Tool is made with Tungsten Steel, making it corrosion resistant. Its size is approx. 130mm. This Spray Guide Toll can help quickly spray edges and trim. Graco Hose Whip Hose connects spray gun with paint hose. 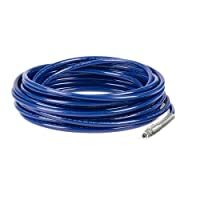 Graco Hose measures 4 ft. x 3/16 in so that it features maximum working pressure of 3000 PSI. The spring guards are Zinc-plated, thus make them corrosion resistant making it more durable and long lasting. Using with Magnum or Graco Airless Paint Sprayers that is available in individual capacity and can use to replace the damage Hose Whip. Graco Airless Spray Gun Filter assists in removing debris from the coating hence helps in protecting the pump, which reduces clogging of the tip as well. This results in a better quality finish of the paint job. People use it for latex, enamels (latex) coatings and using with Graco spray gun models SG10, SG20, SG Pro, SG2 and SG3. So after every use, remember to properly clean it. People can use with the tip sizes .015-inch and larger. 3600PSI Spray Gun width 517 Tip & Guard Airless Paint Sprayer comes with a needle that is easily adjust. Therefore, its maintenance is very easy and hassle free and can quickly finish. The needle’s new design brings a last long and extends service life up to 70%. In like manner, they design it to handle high solid content epoxy paint and primer and can operate smoothly ensuring quality finish. Besides, it can also handle solid content such as polyurethane topcoat and primer coatings, Architectural latex paint, Coal tar epoxy primer, Tanks and piping inner coating. It features 3600 PSI of maximum working pressure. 14. Graco 24E375 TrueCoat Paint Sprayer Cup, 48 oz. Graco TrueCoat Paint Sprayer Cup is available in individual capacity for replacement of the damage or threadbare TrueCoat models 16N658 and 16N659. Specifically, the round shape of the cup makes it possible to use and spray almost all of the paint in the cup. In similar fashion, black banded bottom provides easy grip to twist off of the cup. Disposable cup liners are also available to make the clean-up process fast and hassle free. 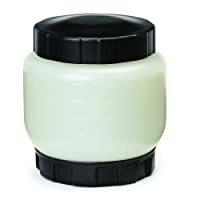 After using, if there is still paint remaining, these lid will do the material storage and quick shake clean-up. Moreover, it is available on major online shopping portals in individual capacity in reasonable price. This spray is a green narrow high precision tip that is specially optimized when using with the ProSpray Technology. It provides ideal control for smaller surfaces hence can give full coverage and smooth finish. In addition, using with stains and other thin paints making the end result optimum. The produce with a 6” fan pattern can do when spraying one foot away from the surface. Meanwhile, it is available individually in the market and painters can easily mount without any hassle on your Graco Airless Paint Sprayer. Graco 60 Mesh Paint Sprayer Filter can use stainless steel with PTFE o-ring and polyethylene screen support. People manufacture the Filter corrosion resistant from waterborne materials, catalysed varnishes and other fluids that are not compatible with carbon steel or aluminium. Polyethylene prevents the screen collapse to enhance the performance to maximum level. It helps reduce the tip clogs, giving high quality finish to the paint job by preventing large particles from interfering with the spray process. Graco 60 Mesh Paint Spray Filter can use for latex paints, enamels and primers. It is sold in the pack of 3 thus helps prolong the life of your spray tip. It maintains the consistent spray pattern and provides high quality and smooth finish. Graco Paint Spray Accessories are available in the market in individual capacity to make it an economical purchase. They are especially manufactured to be compatible with Graco Airless Paint Sprayers. They use the high quality and durable materials and techniques to manufacture these components. As a result, to facilitate end users, these components always come with a manual to assist them in installation and usage procedure.